Like with many things, I believe we have fear of the unknown. When we don’t know something, we have a tendency to want to make sense of it. The most accessible form of information is usually where we turn. In general we don’t understand science and scientific topics very well, but with information about science-y topics, it can be difficult to tell what’s valid and what’s not. First, scientists generally aren’t active, consistent and effective communicators to the lay public. Lastly, citizens are then left confounded and not sure what to believe. This is made more problematic when the public generally pays more attention to loud, negative information over dry scientific information. A mechanism that influences this dynamic is confirmation bias — we seek to confirm our existing beliefs with our information sources. Facebook is confirmation bias in action – the network delivers content based on your preferences. There are many other cognitive biases that you can Google for more information. When it comes to genetically modified foods, farmers and scientists overwhelmingly agree (here and here) that foods modified at the genetic level are safe and beneficial for a variety of reasons. We have been modifying the genes of crops for thousands of years, and much of what we’re eating today is a result of selective breeding, a very clumsy mashup of genetic manipulation compared with GMO technologies that focus on a single gene or a few genes. I’m not a scientist, so I defer what plant scientists say on this issue, and Nina Federoff has a wonderful book called Mendel in the Kitchen that covers this topic in detail. That said, just in the last month, a new study came out by the Pew Research Center that found that only 37% of adults in the US believe it is safe to eat genetically modified foods. This is in contrast to 88% of scientists on the opposite end of the spectrum. I’m not hopeful this will happen in the current generation, but just like with historic plant breeding practices, society will, over time, come to accept them. Refer to Everett Roger’s Diffusion of Innovations for more on how this occurs. 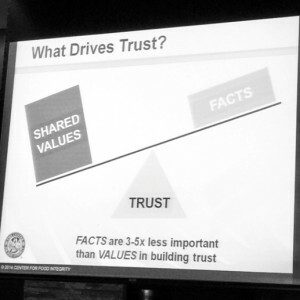 I attended a conference last fall where one of the speakers who deals with this issue regularly put up this slide you see here. 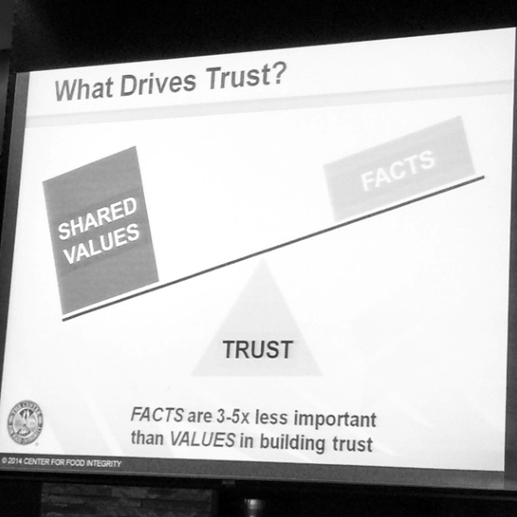 Their research findings show that conveying shared values is far more important than facts when it comes to building trust. Along with that, corporations and researchers with a vested interest in these technologies need to be transparent – and, arguably, so should the activist groups. We need better education. Journalists in particular could benefit from training in research, statistics and the hard sciences. We need to understand that not all sources of information are created equal. Anymore, it may take years of either direct experience or immersion in a field to adequately understand it. Learning from our Facebook feed is inadequate. If you want to learn about plant biotechnology, talk with those directly involved with it – UNR has world-class faculty in this field. Be skeptical of fear-based journalism and information as entertainment – Dr. Oz and the Food Babe and your local daily news sources. If the body of scientific knowledge has a defined perspective on something – vaccinations, GMOs, climate change – there’s a very good chance we can consider that information reliable even if it is evolving and there may be gaps in knowledge along the way – in fact, it’s a trait of scientific knowledge to be ever evolving and incomplete. News journalism is often not a good source of science information. The news cycle is so speculative any more and focused on drama, I don’t believe we should be source news stories for reliable information. Focus on those who write about peer-reviewed research. Lastly, it’s not helpful to refer to people as “dumb” or “ignorant” for not understanding complex issues. There are always opportunities for better education and dialogue.